"It seemed like the critics at the time looked upon us as not quite a jazz band. Our concept of bebop was quite different from all of the New Yorkers, the Detroit sound in that day. We always had a factor of rhythm and blues under the music. And it was very, very appealing to listeners. 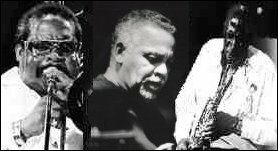 Along with three other Texans--Wilton Felder, Wayne Henderson, and Stix Hooper--Joe Sample founded the Jazz Crusaders, one of the finest soul-jazz combos of its time, a group that refused to choose from among its loves for small-group jazz, blues, and soul. They had an unusual trombone-and-tenor front line, but they made it work, both musically and commercially, and the Jazz Crusaders became one of the most popular acts in jazz during the late '60s. In the '70s, seeking wider appeal, they dropped the first part of the band's name and became the Crusaders. A short time later, trombonist Henderson left the group. When he did, the Crusaders gradually evolved into a funk band. In the early '80s, they had their biggest hit with Street Life. Even during the days of commercial success, the Crusaders had at their core a note of integrity. Among the many groups that walked the line between jazz and pop, or between jazz and easy listening, Sample's bands stood out. He also stood out for his concert and studio work with [Tom Scott], Marvin Gaye, Tina Turner, B.B. King, Joe Cocker, and Anita Baker. Today, that integrity has helped him build a successful solo career. --JONATHAN EIG, "Hard Hands, Sweet Soul,"
After a couple of decades of producing such artists as Ronnie Laws and Bobby Lyle, Wayne Henderson began tiring of endless meetings with accountants and attorneys and wanting to get his hands on a trombone again. That urge made him think first and foremost about the musicians he'd grown up with in Texas in the early '50s, later known to the world as the Jazz Crusaders or the just plain Crusaders. He called former band member and saxophonist Wilton Felder, drummer Nesbert "Stix" Hooper and pianist Joe Sample, all of whom had gone their separate ways. "We sat down for a few meetings; we were going to do a reunion," recounts the trombonist from his L.A. home. "But Joe's career has taken off and he's just been very, very busy and Stix, I think, was managing Ernestine Anderson and serving with NARAS . . . so I said, 'Wilton, it's hard to catch up with the cats, let's hit'"
The result, proclaimed by its title as Happy Again, was released by Sin-Drome, a small L.A. label which had shared the album's taste. Called "contemporary funk" by henderson, it smacks of more of a sophisticated flavor which the Jazz Crusaders had imprted as "the Gulf Coast sound" in the '60s. Henderson and Sin-Drome president Henry Marx assembled former Crusaders Larry Carlton and N'Degu Chancler alongside Felder, Henderson protege Lyle, fellow Texan Hubert Laws, vocalist Bobby Caldwell (the label's flagship artist) and Poncho Sanchez, all under the revived Jazz Crusaders moniker. It's high time for the return of the Jazz Crusaders, Henderson believes, "because 'jazz' is 'in' now . . . even rappers are sampling our music." But his dearest dream is to bring the original players back together. "We formed our first band back in elementary school and always said we wanted to 'crusade for jazz.' We have to hook back up and do it again, after that we can let the smoke clear, so I think you're gonna see a reunion. For now, Wilton and I are 'Jazz Crusading' to the max." --JEFF KALISS, "Side By Side: The Jazz Crusaders,"
A selected discography of The Jazz Crusaders albums. Freedom Sound, 1961, Pacific Jazz. Lookin' Ahead, 1962, Pacific Jazz. At The Lighthouse, 1962, Pacific Jazz. The Thing, 1962, Pacific Jazz. Stretchin' Out, 1964, Pacific Jazz. Live At The Lighthouse '66, 1966, Pacific Jazz. Best Of The Jazz Crusaders, 1961-66, Pacific Jazz.